Early records suggest scattered clusters of inhabitants had already settled in Bhutan when the first recorded settlers arrived 1,400 years ago. Bhutan’s indigenous population is the Drukpa. 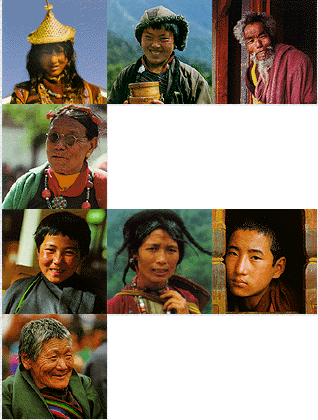 Three main ethnic groups, the Sharchops, Ngalops and the Lhotshampas (of Nepalese origin) make up today’s Drukpa. Bhutan’s earliest residents, the Sharchops, reside predominantly in eastern Bhutan. Their origin can be traced to the tribes of north Burma and north-east India. The Ngalops migrated from the Tibetan plains and are the importers of Buddhism to the kingdom. Most of the Lhotshampas migrated to the southern plains in search of agricultural land and work in the early 20th Century. The geography of the land kept each ethnic group separate until the middle of this century when roads were built between the east and the west. As a result, the Sharchops have retained their influence over the east, while the Ngalops predominate in the west. And the Nepalese have retained their homes in the south of Bhutan. The contrasting ethnic diversity of the Bhutanese people has meant that a number of different languages and dialects are spoken throughout the kingdom. The national language is Dzongkha, which is taught at all schools. So different are the dialects that eastern and western neighbours can have great difficulty understanding each other. The national newspaper, Kuensel, is written in Dzongkha, English and Nepali. A growing proportion of the people, especially in the urban areas, speak English. The current medium of instruction in Bhutan is English. However, increasing efforts are being made to write more textbooks and to introduce Dzongkha as the principle language of instruction.